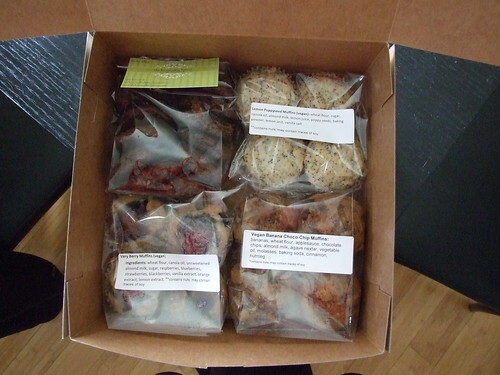 The Lovemuffin Bakery: Vegan delivery in Toronto – vegan in your city. I have ordered from the lovemuffin bakery twice so far. I’m going to say something, and know that I’m very serious when I do. I am over cupcakes. If I never see another cupcake again, I would be okay with that. 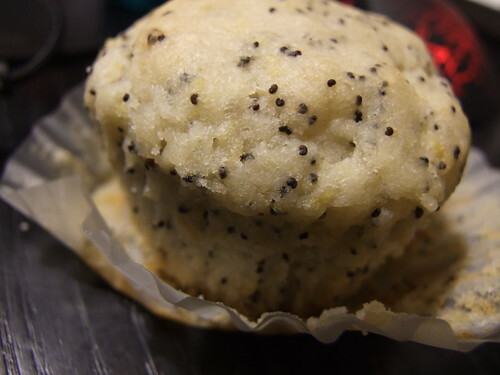 Muffins are the new cupcake. When I arrived, it was on our deck – ready, and waiting to be opened and eaten. The box and paper bag look a little strange because I intentionally and poorly edited out our address. I first discovered this delivery bakeshop via twitter/facebook, but ultimately what won out was they donated cookies to a bake sale at Pet Value raising funds for Homeless Cat Rescue, and we decided to drive out and try it. Totally proving that having an engaging online presence, supporting worthwhile causes, and making an awesome product go hand in hand in hand to build up a brand. Okay, and now I’ll take off my marketing hat. 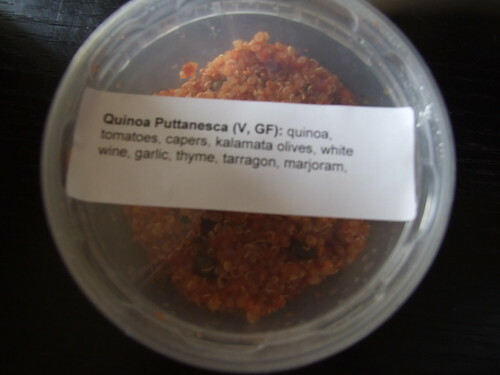 The moment I got inside the house I opened the qunioa puttaneseca and ate it. Which got me thinking about the word puttanesca, which I’m not going to talk about here, but there is an interesting article on how Austria was trying to ban discriminatory food names. Back to the food, it was spicy, dense, and delicious. Dinner was served and I ate it unheated, straight out of the little plastic container it came in. Capers, olives, tomato, and quinoa, lightly spiced, but not too spicy. The muffins, were as usual, delicious. 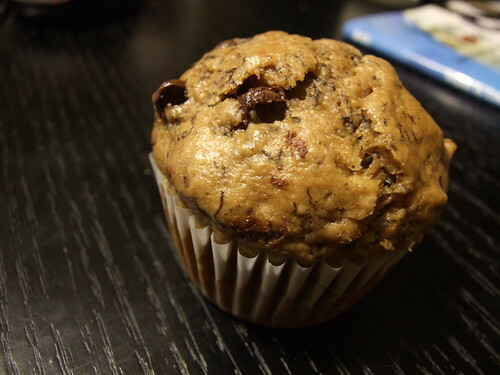 I ordered an assorted pack, because I both cannot make a muffin related decision, and if it was solely up to me I’d just get the one with the most chocolate, and that’s not really branching out much. 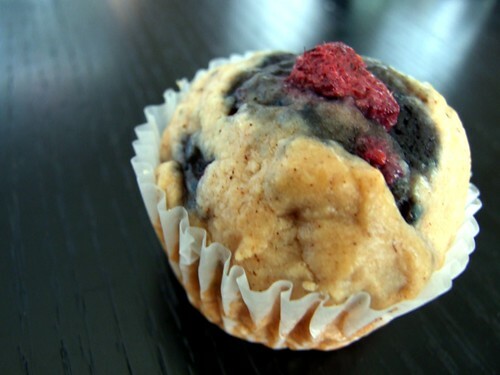 The following muffins made last weeks breakfasts and lunches just a little bit more fun. I also ordered a dozen Double Chocolate Oatmeal cookies, and now I never want to order any other ones. Even though the first cookies from the lovemuffin bakery to win my heart were the ginger snaps they donated to the bakesale, these cookies are soft and chocolatey and tasty, and have a bit of oatmeal in them. win win win. love muffin, lovemuffin bakery, muffins. Bookmark.